CPU: X5650 x 2, 2.66GHz, Six core CPU. Perc 6i Raid Card with battery. Model: R710 3.5" 6 Bay. 6 x 3.5" caddy with screws included. Rack Rail Kit can be included for £50.00. The images used are for illustration purposes only. CPU: X5650 x 2, 2.66GHz, Six core CPU. Perc 6i Raid Card with battery. Model: R710. Perc6i Raid Card. Rack Rail Kit can be included for £50.00. Buy it Now! The images used are for illustration purposes only. Dual Xeon E5620 CPU (4 physical cores each, 8 total, 16 logical with hyperthreading, 2.4GHz). 48gb PC3 ECC Reg'd RAM. Dell R610 Server. 4x Dell original SAS HDD. 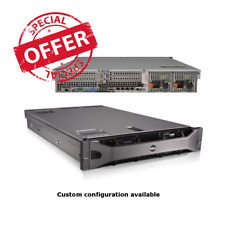 HP Proliant DL360p G8, Dual XEON processors, Build Your Own! CPU: E5620 x 2, 2.40GHz - 2.66GHz, 4 Core, 8 Threads CPU. Perc 6i Raid Card with battery. Model: R710. Rack Rail Kit can be included for £50.00. Buy it Now! iDrac6 ENT. The images used are for illustration purposes only. Dell PowerEdge R610. Storage: 5 x SSD 100GB. Rack Rails kit: Yes, included. CPU: X5680 x 2, 3.33GHz - 3.60GHz, 6 Core, 12 Threads CPU. Perc 6i Raid Card with battery. Model: R710. Rack Rail Kit can be included for £50.00. CPU: E5620 x 2, 2.40GHz - 2.66GHz, 4 Core, 8 Threads CPU. 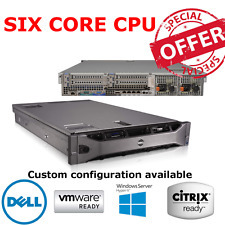 Dell PowerEdge R610 2x Xeon X5670 2.93GHZ Six Core 48GB DDR3 3x 300GB 10K 2.5"
DELL PowerEdge R610 2x X5670 2.93Ghz 48GB DDR3 SAS 6/IR 900GB 10K iDRAC6 Enterprise. DELL PowerEdge R610. 2 x Xeon X5670 2.93Ghz. 48Gb DDR3 ( Upgrade Possible ). 3x 300GB 10K 2.5" Enterprise ( upgrade possible ). W 48GB RAM. 8x 500GB HDD. PowerEdge Appliance Server. Ram 48GB DDR3. 1TB (2 x 500GB 2.5" 7.2K SAS). The product images shown are for illustration purposes only and may not be an exact representation of the condition of the product you will receive. Hard Drive. 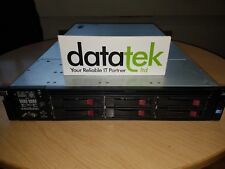 HP DL360e G8 1U Rack Server. 2 x E5-2450L Eight Core CPU's (16-Core total). (if you want to run SAS Drives then you will need to change the raid). 8xSFF Drive Bays - No Drives or caddies are included. HP DL360 G7 Dual Xeon 2.53GHz 48GB Ram 2 X 500GB HDD. In superb condition as you can see from photos. The server has been professionally Refurbished by us here at Tech-cycle Limited. Buy with confidence, over 20 years IT experience. Can deliver locally or be collected from Mawdesley Lancashire. Dell PowerEdge R610 Server. This server is used but was working when removed from site. Apart from being powered up it has been tested to BIOS. CD/DVD Drive. CPU: X5660 x 2, 2.80GHz - 3.20GHz, 6 Core, 12 Threads CPU. Perc 6i Raid Card with battery. Model: R710. Rack Rail Kit can be included for £50.00. CPU: E5620 x 2, 2.40GHz - 2.66GHz, 4 Core, 8 Threads CPU. Gen8 HP DL380e 25 SFF model. 48Gb ram P420 1gb cache BBU. We will resolve the problem directly with you. 2x 2.00GHz 8Core AMD Opteron 6128 CPUs, 12MB. HP ProLiant DL385 G7 Rackmount Server. 2x 146GB 10K. p410i/ 512MB battery. 8 x 600GB SAS Drives. 2 x 750W Power Supplied. Fully Tested with HP Diagnostics. We Also Record Serial Numbers. Fully Tested. IBM System x3650 Server. Cash on collection. Dual Power Supplies. CPU: X5670 x 2, 2.93GHz, Hex core CPU. Model: HP DL380 G7. Storage: NO HDD. Fully tested and working 100%. Buy it Now! HP Proliant DL380P Gen 8 Rack Server (2u). Rack Rails: Not Included . Server Options / upgrades . Backplane: 1x 8Bay 2.5” SFF SATA. OS (Evaluation Ver) Warranty: 12 Months RTB Warranty. Condition: Refurbished. DELL WORKSTATION PRECISION T7500. We will resolve the problem directly with you. No cpu ram or video card. CPU: L5640 x 2, 2.26GHz - 2.80GHz, 6 Core, 12 Threads CPU. Perc 6i Raid Card with battery. Model: R710. Rack Rail Kit can be included for £50.00. CPU: E5620 x 2, 2.40GHz - 2.66GHz, 4 Core, 8 Threads CPU. For data-centre deployed applications such as VMware ESXi and Citrix XenServer virtualization, there is no better choice than the HP ProLiant DL380 G7. RAM: 48GB RAM. Model: HP ProLiant DL380 G7. All of our servers are refurbished to a very high standard. HP ProLiant-DL360P Gen8 2x E5-26202.00GHz 12-Core Xeon 48GB DDR3 2x80GB SSD Disk RAID P420i/1GB FBWC. HP ProLiant DL360p Gen8 - Turbo 2.50 GHz. HP Proliant Servers. 48GB DDR3 Installed. HP Proliant DL380 G5. Model: HP ProLiant DL380p Gen8, HP DL380p G8. As you can see the DL380p Gen8 gives you massive potential for expansion, and safeguarding your data centers future growth. The answer is quite simple. RAM: 48GB DDR3 RAM Installed. IDrac Remote Access Module. 48 GB DDR3 Ram. Location: Demo Room. 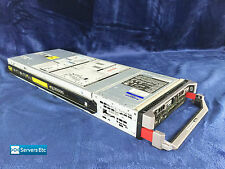 Model: ProLiant SL2x170z G6 x 4. Storage Capacity Total 160GB x 4. 100% Tested. Overall a really nice system. DIMM DDR3 1333 MHz (0.8 ns) 4 GB. Total RAM modules Total DIMM DDR3 1333 MHz (0.8 ns) 4 GB. 2x450GB 3.5“ SAS drives in hot swap caddies. (windows drive in raid 1 capacity 450GB). - 6x2TB 3.5“ SAS drives in hot swap caddies. - 5U tower case (with front bezel included and key). WHAT'SNOT INCLUDED: - Hard drives / Outer Rails / Cables / Accessories / Software etc. WHAT'S INCLUDED: - Server ONLY. TESTING: - Powers up to BIOS fine without any errors or passwords. Fans run fine. Supermicro Superserver 6016 GT Dual 6 Core Xeon L5640 2.26 Ghz 48 GB Ram Used condition, includes rails. Purchased for a project, but was not required. 2 x E5-2640 Octa Core CPUs. Supermicro SuperServer. Superb high performance server. 4 x drive caddies. Call us for any queries you may have regarding this or other products we have available. Fantastic condition. 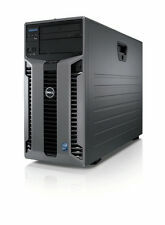 Model: Dell Precision R5500. All of our servers are refurbished to a very high standard. Internal parts (such as RAM and CPUs) are tested individually, and once the components are installed the system is tested in full. Tested with VMWARE ESXI. 6.5 Windows 2016 / windows 2012 HPC. Rack Rails: Not Included . Backplane: 1x 8 Bay 2.5” SFF SATA /SAS /SSD. OS (Evaluation Ver) Warranty: 6 Months RTB Warranty. Condition: Refurbished. HP Proliant DL380 G7. 32Gb PC3 DDR3. 2x Redundant Power Supplies. We are able to source hard to find parts for Legacy systems through to the latest new in box parts for the latest generations of servers & storage systems.